A Web service is an abstract notion whose purpose is to provide some functionality to the other systems or products (web service clients) which are running on different platforms and implemented using different programming languages. Web service clients have to follow a contract of the web service which details how to use service. 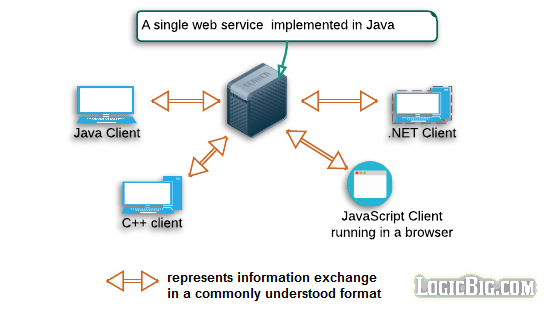 For example a web service created in a .NET platform can be invoked by any client application implemented in Java language. A Web service is not dependent on a particular implementation technology. We might implement a particular Web service using one technology one day (written in one programming language), and a different implementation the next day (written in a different programming language) with the same functionality. Although the underlying technology (programming language) may have changed, the Web service remains the same. A client (requester) entity is a separate software system that makes use of a provider entity's Web service. The client sends a request message and the web service sends back the response message. In order for this message exchange to be successful, the requester entity and the provider entity must first agree on both the semantics and the mechanics (the contract) of the message exchange. The messages used in exchange contain self-containing information which do not make assumptions about the technological capabilities of the either side. the purpose and function of the web service. a valid data format used to define the structure of the request/response messages. information about how and where the service can be accessed. Web sites' response contain information embedded in presentation directives, whereas web services' response contain only information without any presentation directives or logic. Also a web service requester is another software system, whereas a web site requester is a human being.